Bespoke Madchester T-Shirt designed by artist Mark Reynolds. 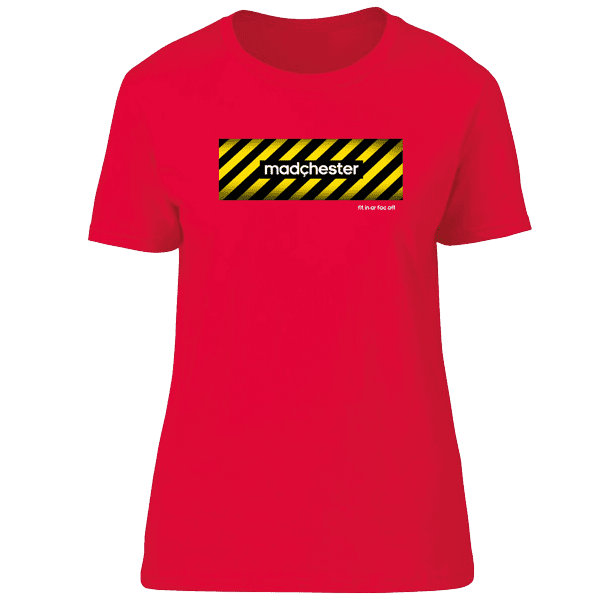 The T-Shirt features a hazard warning sign background with the words Madchester on. Madchester is a music and cultural scene that developed in the Manchester area of the United Kingdom in the late 1980s. It also features the words “Fit In Or Fac Off” representing the Fac in Fac 51 The Haçienda. FAC 51 was its official designation in the Factory catalogue. This T-Shirt is available in a wide range of colours and sizes. The Haçienda was a nightclub and music venue in Manchester, England, which became famous in the Madchester years of the 1980s and early 1990s. The Haçienda opened in 1982, and despite considerable and persistent financial troubles survived until 1997 – the club was mainly supported by record sales from New Order. The Haçienda is associated with the rise of acid house and rave music.